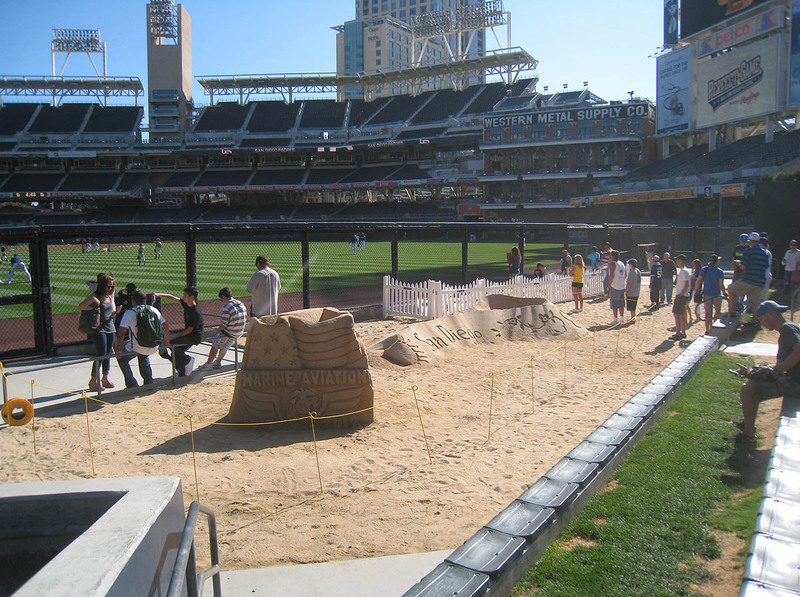 One great thing about PETCO Park is “The Beach” in right-center field; having a huge sandbox-like section inside a stadium is a marvelous, kid-friendly idea. Unfortunately, though, half the section is usually roped off and wasted with sand sculptures. 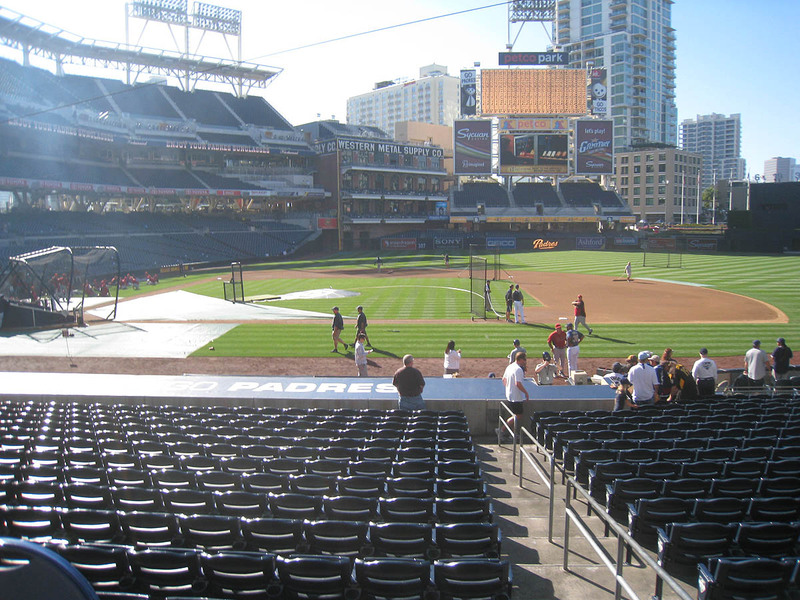 That was the case at this game . . .
. . . and that’s where I spent the first half-hour of batting practice. 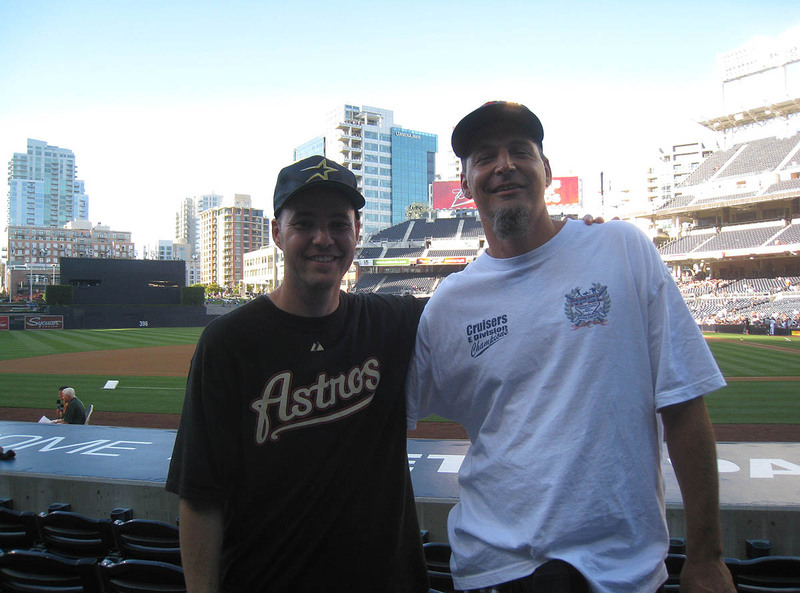 I’m not in the photo above, but I need to point out two of the people who are: the guy in the Luebke jersey is named Ismael (there’s a photo of him in my previous entry), and the guy in the brown shirt is named Leigh (aka “Padre Leigh” in the comments section of this blog). I got a couple toss-ups of my own in that section. 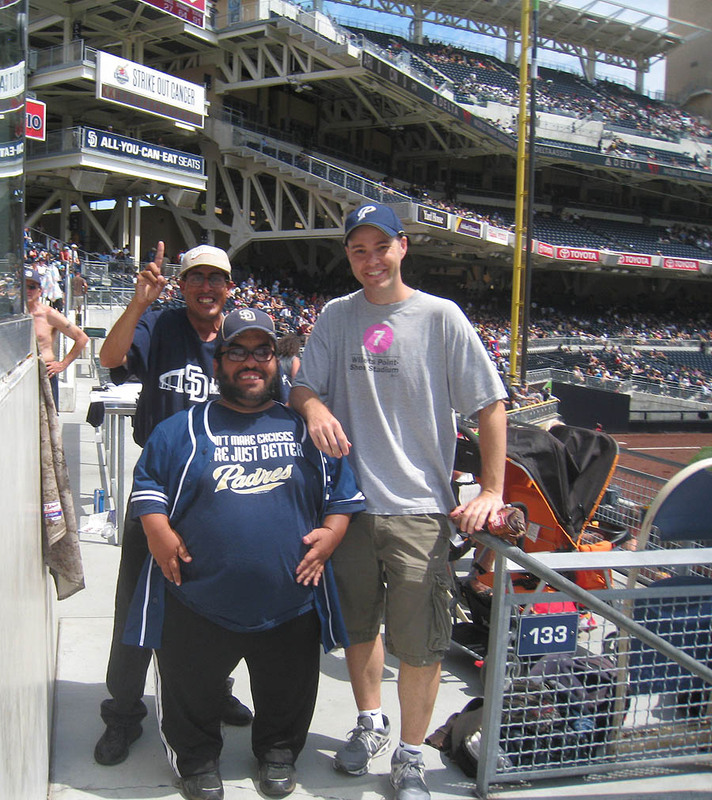 The first came from Padres bullpen coach Jimmy Jones, and the second came from one of the players kids. 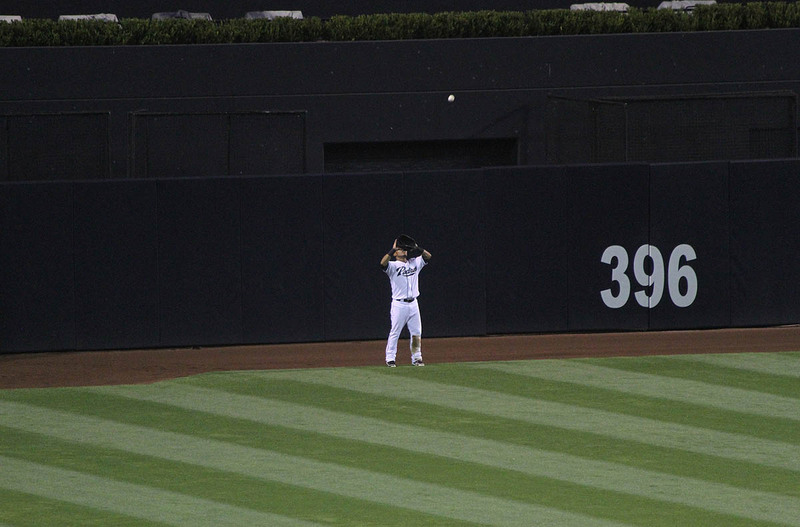 That’s not the most exciting way to get a ball, but hey, it counts. 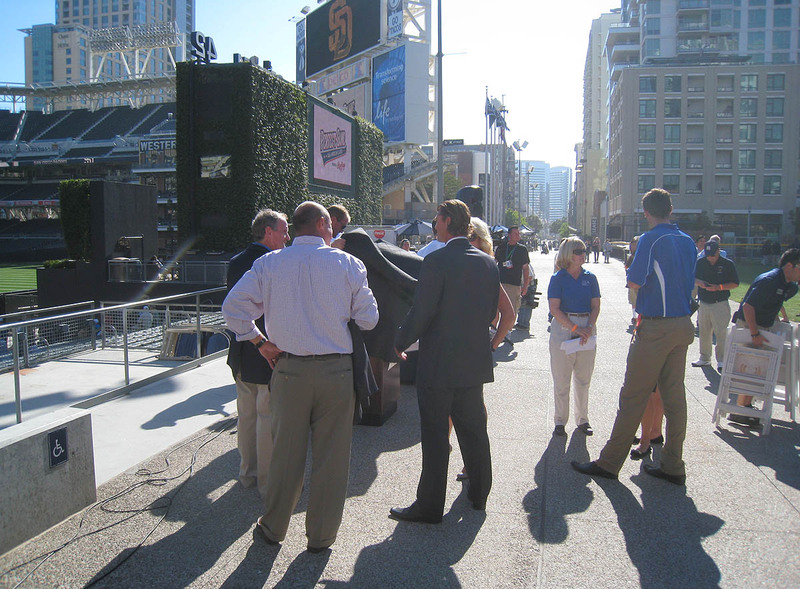 In the photo above, do you see the guy in the dark gray suit? 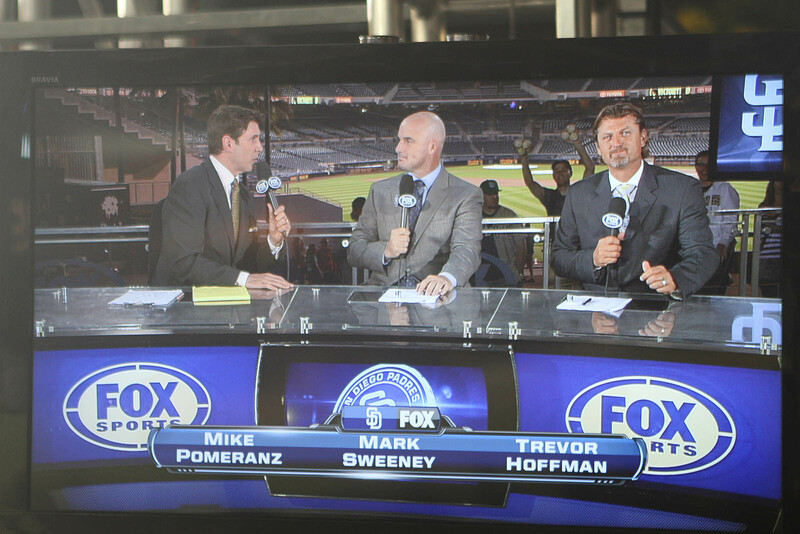 That’s Trevor Hoffman! I really wanted to say hello and get a photo with him, but he was busy — just as well, perhaps, because there were baseballs to be snagged. 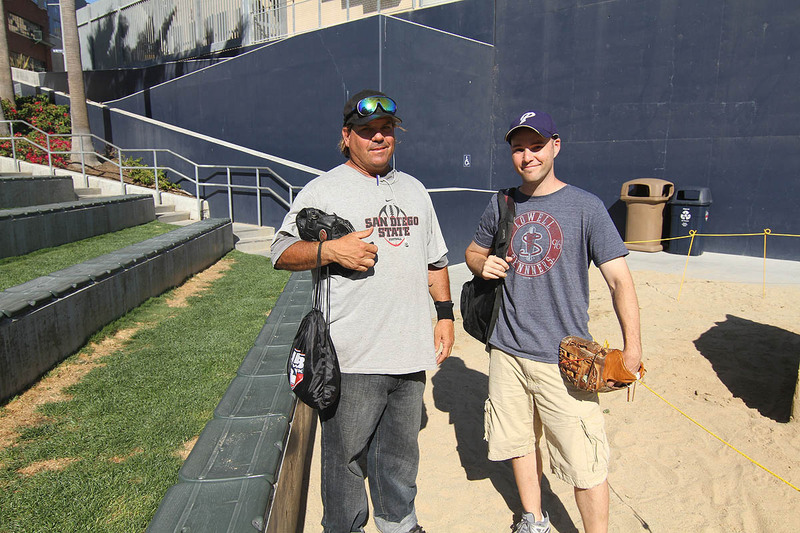 As you can see, I was still holding one of the “Easter eggs” with my left hand; I was snagging baseballs faster than I could toss them into my backpack. A few minutes later, Ross Ohlendorf jogged over to retrieve a ball in the left field corner. 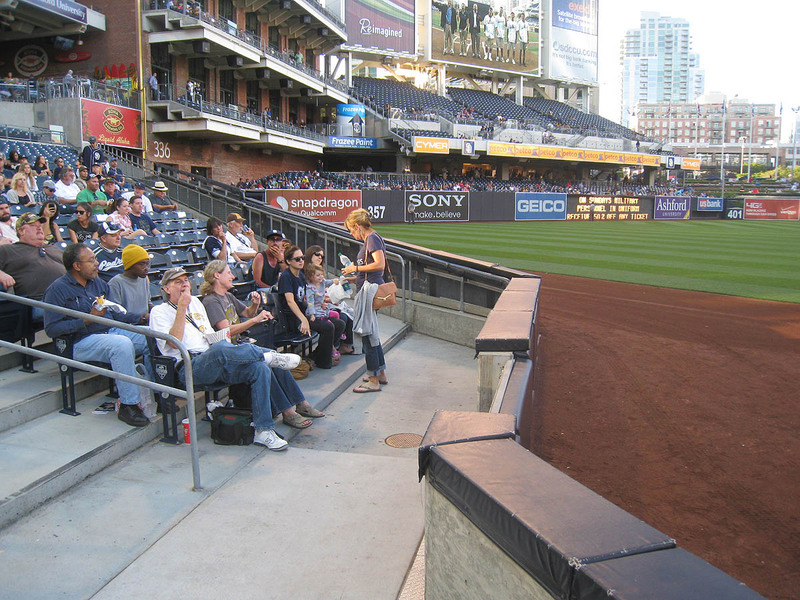 Before he bent down to pick it up, I asked him if he wanted to play catch — a reasonable request, given how empty the stands were. 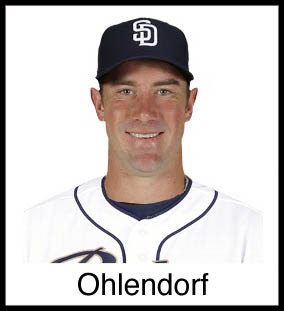 What did Ohlendorf do? He threw the ball to me and started walking away. “Oh, MAN!! !” I shouted, exaggerating my disappointment. And that’s exactly what happened. I chucked the ball to him, and he tossed it back — not life-changing, but still fun. 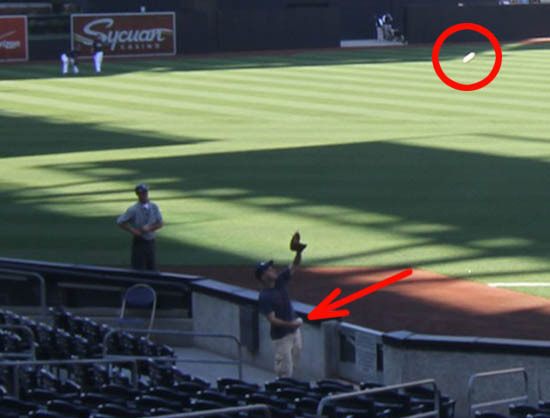 Hopefully he got some footage of me snagging my 8th ball of the day — a foul grounder that deflected off a protective screen on the warning track and rolled near me. 1) The power-hitting lefties were absolutely worthless. 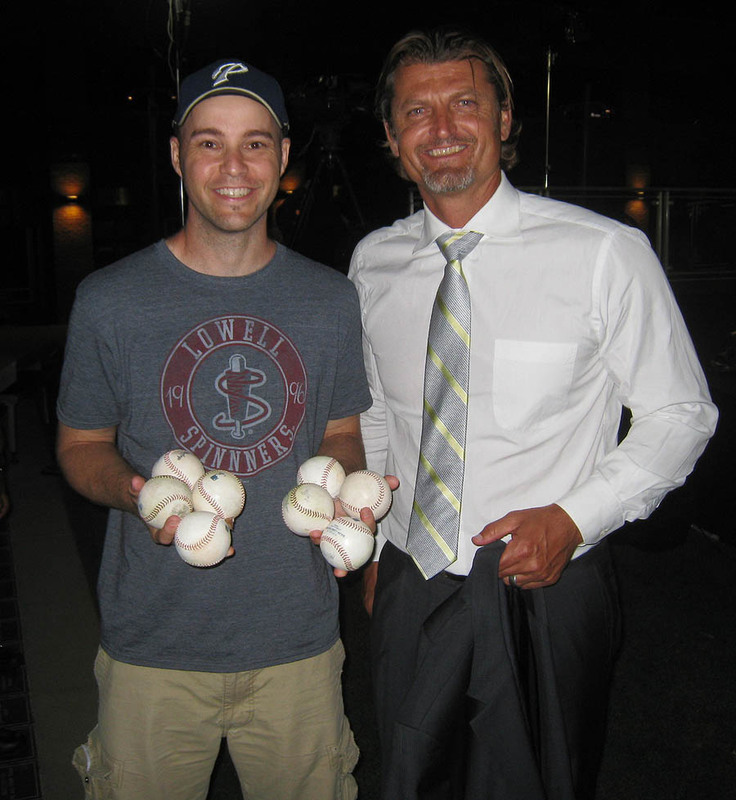 2) Several Astros players recognized me and wouldn’t toss balls to me. 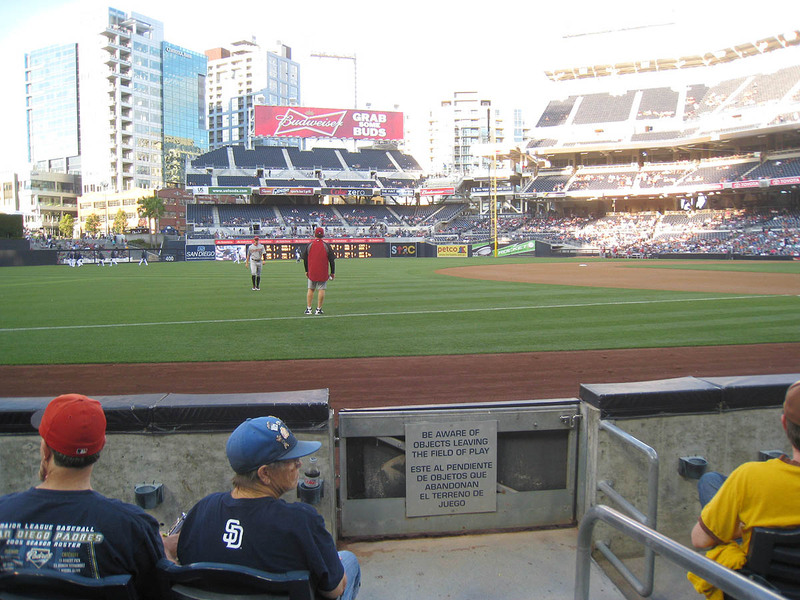 3) The left field seats are configured miserably for catching home runs. 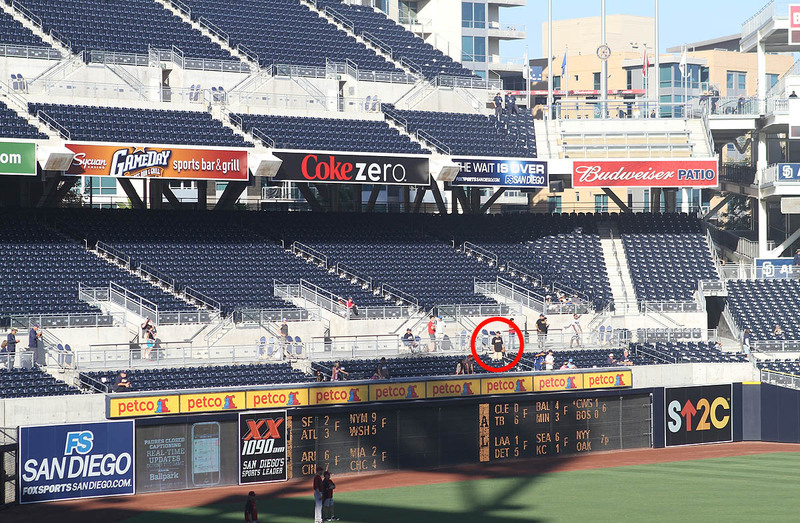 4) There was a PETCO Park regular named Kurt in the prime spot in left field, and I didn’t want to get in his way. It would’ve been fun to compete against him, but out of respect, I decided to give him space . . . and he ended up catching four homers on the fly. “Padre Leigh” caught up with me at the dugout . 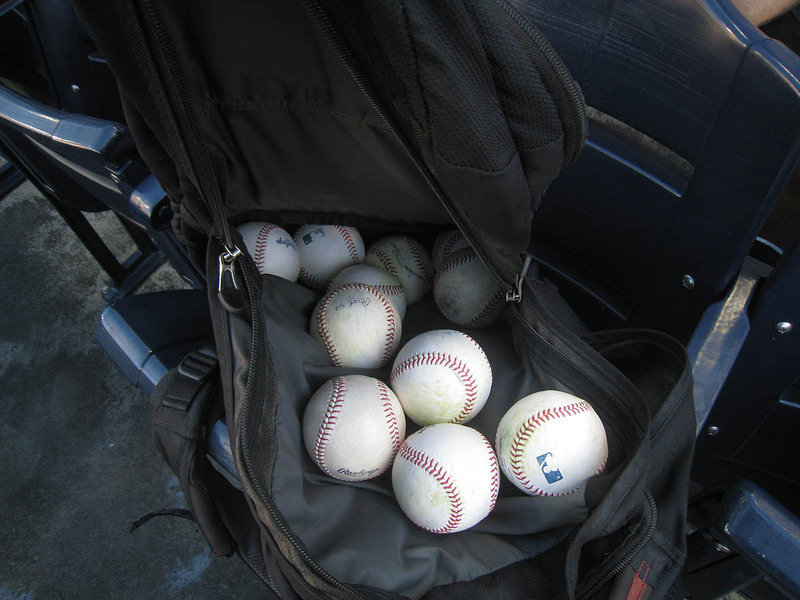 . .
During games, Kurt exclusively goes for foul balls, and T.C. goes for homers. They’re both really laid-back, but don’t let that fool you. 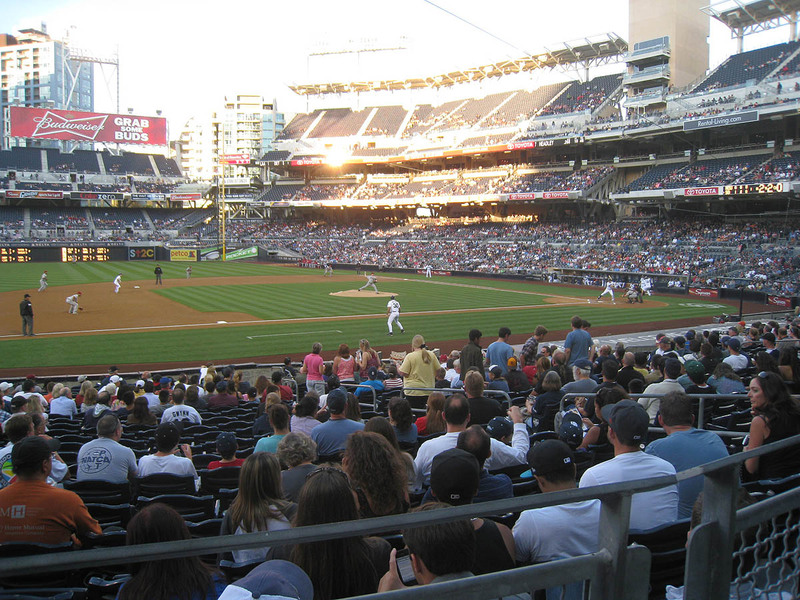 They cover lots of ground and seem to catch more batted balls at PETCO than anyone. It’s safe to say that he’s in love, but here’s the kicker: he has no idea who she is. 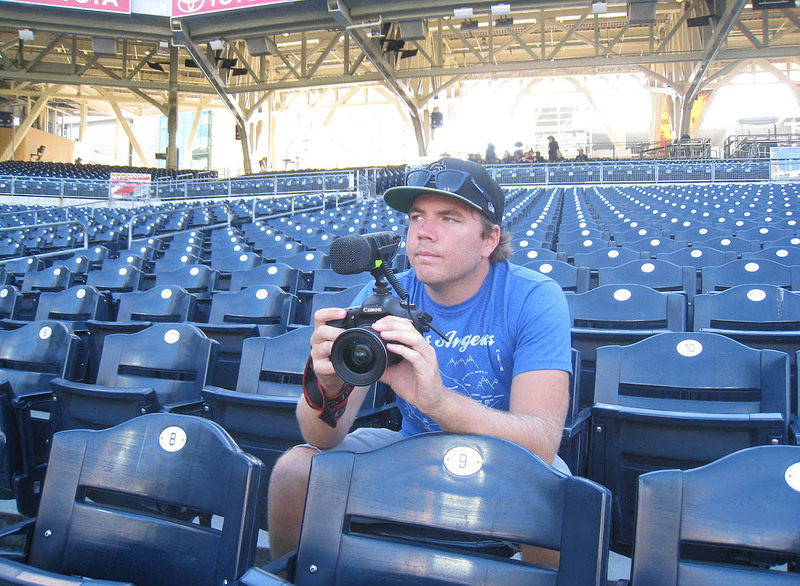 He thinks she’s a Padres intern, but that’s all he’s got, so if anyone knows anything and/or has any expertise in arranged marriages, leave a comment here or give him a shout on Twitter @Trickholmes. 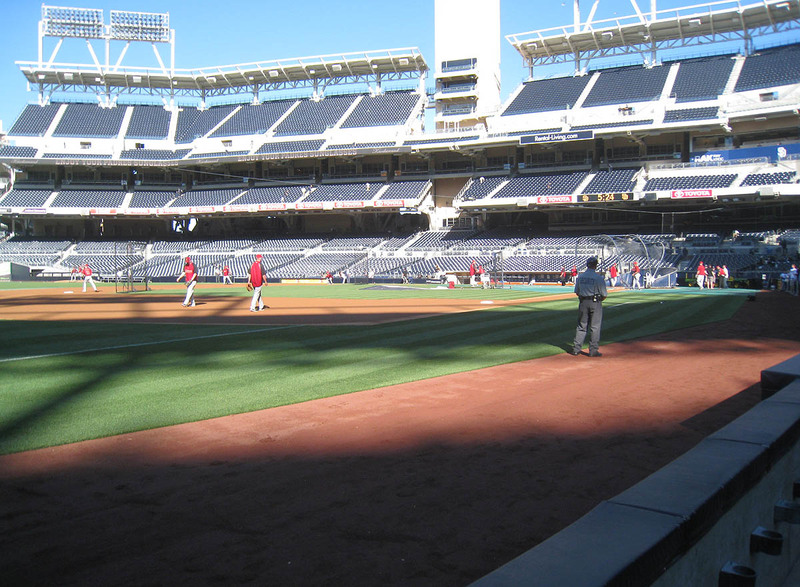 Then I moved to right field for a while . . . 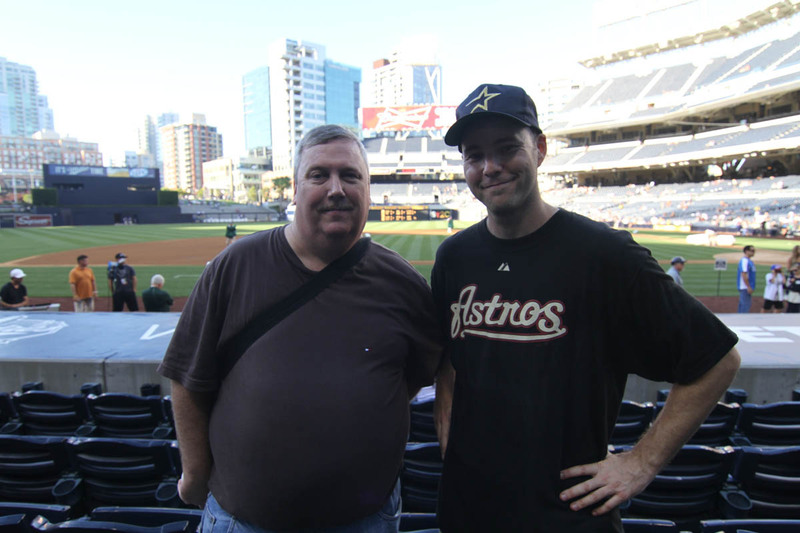 Final score: Padres 1, Astros 0. 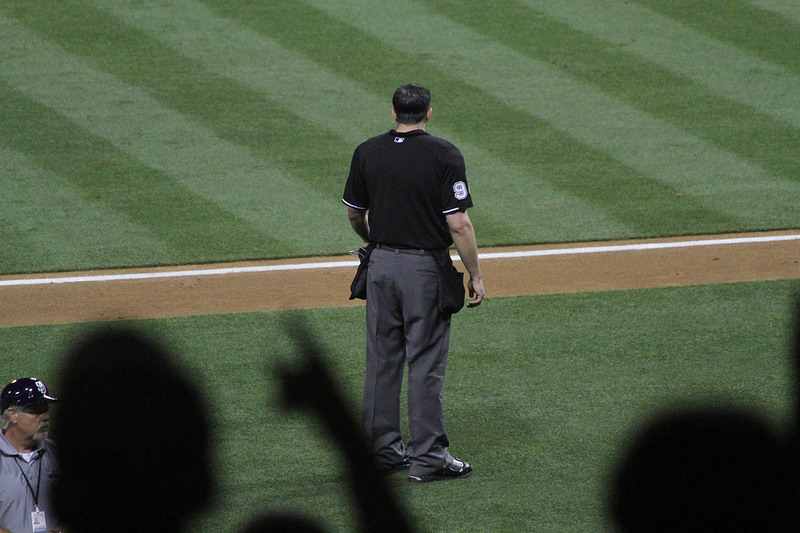 After the final out, Brandon happened to take a picture of home plate umpire Lance Barrett . . .
. . . which turned out to be significant because Barrett hooked me up with my 16th and final ball of the day. 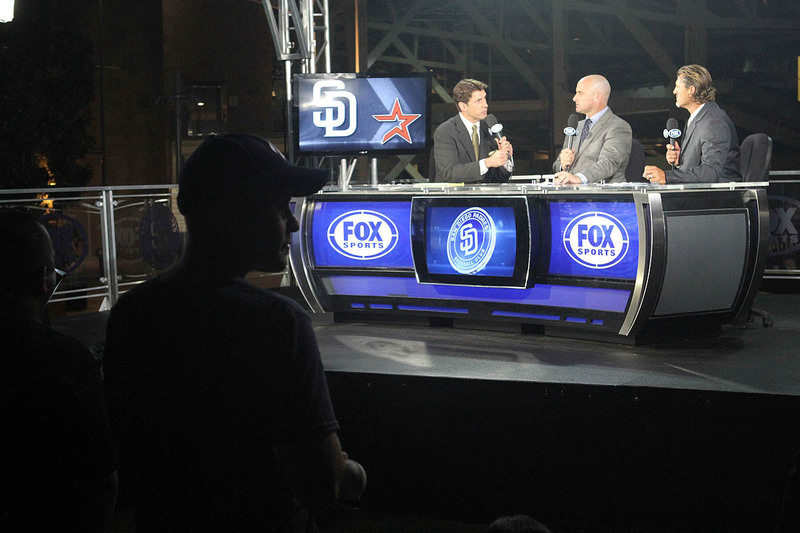 The FOX Sports post-game show was taking place in the “Park at the Park.” That’s the area in very deep center field, and as is often the case with post-game shows, fans are able to hang out in the background and be obnoxious and get on TV. Everyone else was waiting/dying to get Hoffman’s autograph, but as I mentioned earlier when I saw him during BP, I just wanted to say hello and get a photo. It took a while for the show to wrap up, but eventually . . .
• 312 balls in 39 games this season = 8 balls per game. I am fine if you move to San Diego! That way, it is easier for you to get to Oakland! ;) And on that note, how bout my A’s? 15-2 in July isnt half bad! 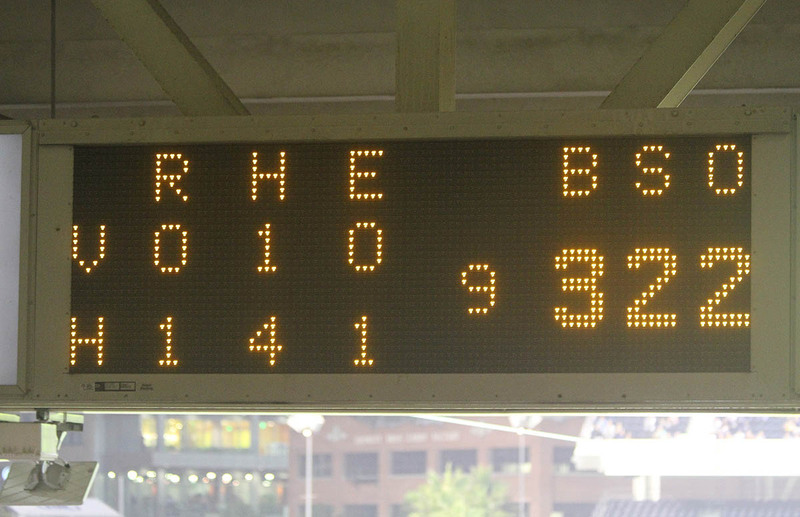 You should go to Progressive Field again. I could say high if you got to the August 12th game vs Boston. Like the shirt in the vid! Got any Arlington plans this year? I like the picture of me about the ROB old Ismael. Good times. For the record I gave the ball to the kid with the glove in the front of the picture. He was visiting from Dallas with his dad. Later in the game they actually found me in the seats and thanked me again. The kid showed me the Luke Gregerson autograph he got on the ball. It felt good knowing I made a difference that day. 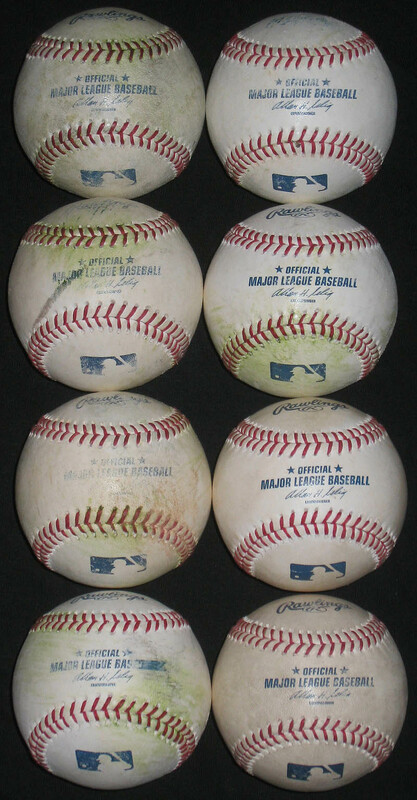 I wound up with 6 that day and gave two to kids and another to a woman that got hit in the head by a ball. It was a ground rule double to left that went off the warning track, then off her head and right to me. I had to give it to her. LOL. Just missed a Yonder Alonzo almost home run too. Oh well. 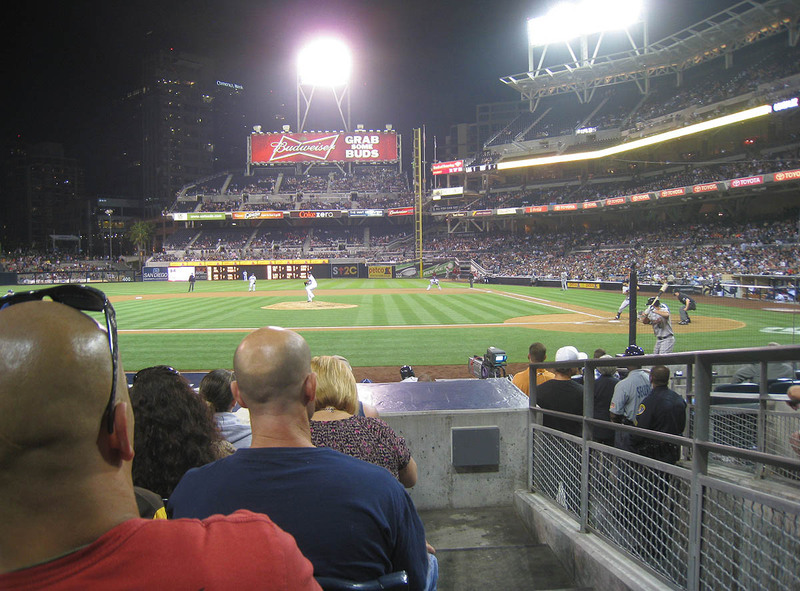 That was my second one-hitter at PETCO. 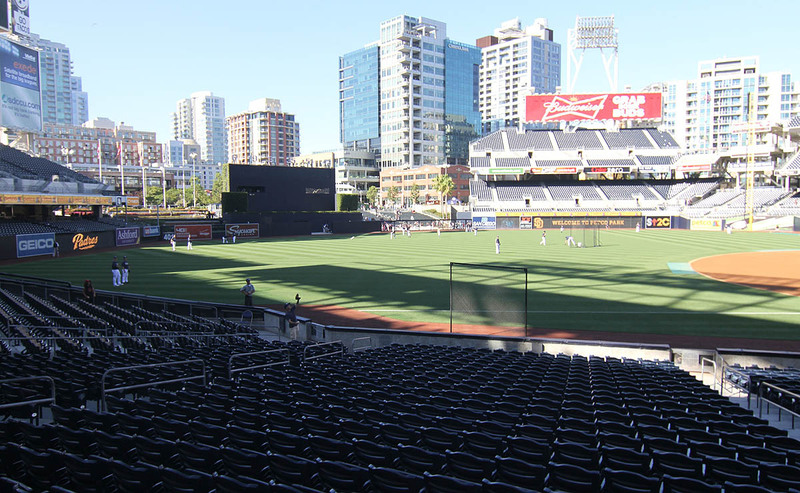 Will the Padres ever get one? It was interesting watching you run around. 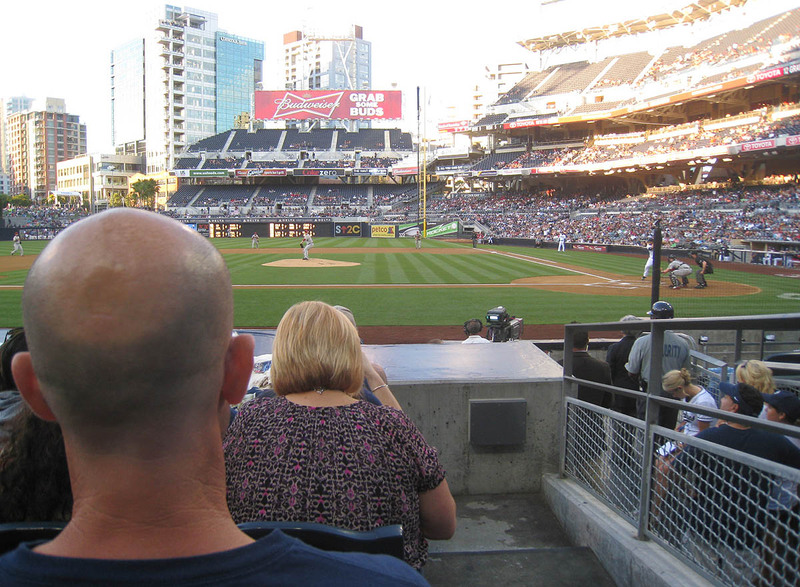 The PETCO regulars are just not that into it so it’s something different to watch. Hope you had fun while you were here. P.S. 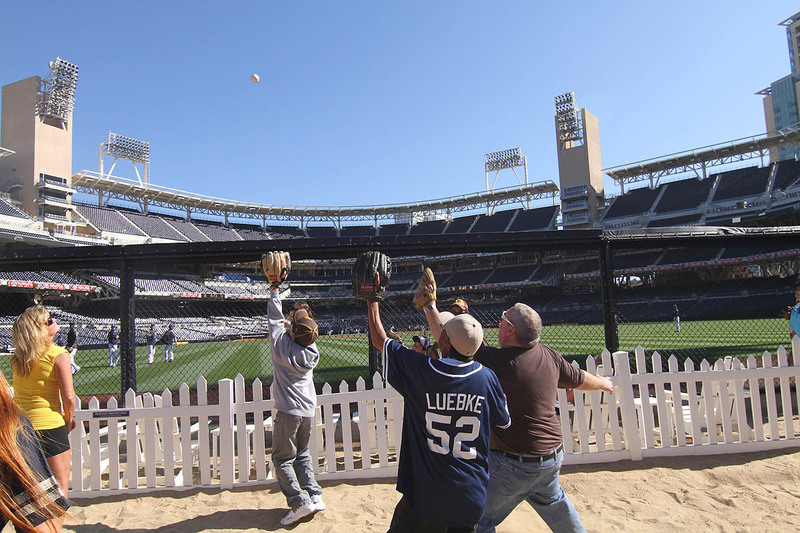 I told you it was against the rules to glove trick at PETCO. Shame on you. Ok, if my calculations are correct (pretty sure I didn’t miss any, but who knows), not including your Japan trip, you’ve given away 66 balls to kids this year. If you DO include the Japan trip, you’ve given away 74, but 4 of those were taken away by ‘evil ushers’. Do I win a prize or something? Even if I was off? And by the way, Brandon is right…that blonde is a beauty!! I’m not on twitter so I’ll shoot you an email you can forward to Brandon…I think I might know who that is. Hi Zack, no commemorative Astros balls? Was this a surprise? I am hoping to get one in the near future. I’m not sure. It’d be nice to make it down this season for a game or two, but right now, I don’t have any plans to be there. Thanks very nice of you to say. As for the A’s . . . OH MY GOD. I did not predict this at all. I expected them to be terrible this year. I definitely won’t be there that day, but I’m giving a “speech” at a library in Worthington, Ohio on September 5th . . . in case you can swing it. No Arlington plans. So sad. I wish I could be there all the time. I thought the number would be higher, but that’s still pretty good — about 1.5 balls per game. A prize, huh . . . ? Thanks for the emails. You should be a detective. Not one. It was pretty surprising/disappointing. OK, if it’s for the kids………………. I don’t think anyone, whether it be anoyone who reads this blog, A’s fans like me, MLB Network or ESPN, or even the A’s orginization expcected to be in contention this late into July. I think the 2nd Wild Card will give everyone hope, which will be interesting whent there are 6 teams 1 game or less back with 2 days left in the season. 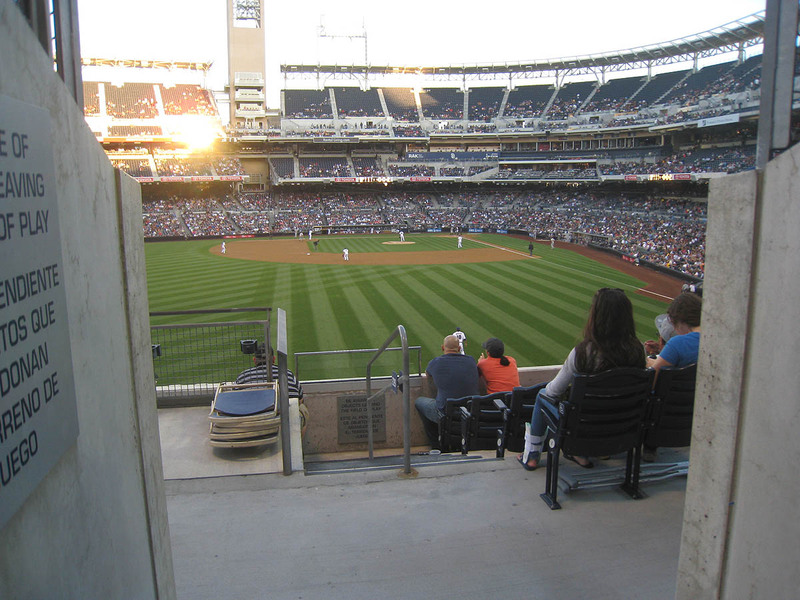 And on a completely unrelated note, I think I am going to get a 22-game season ticket plan for the Oakland bleachers. 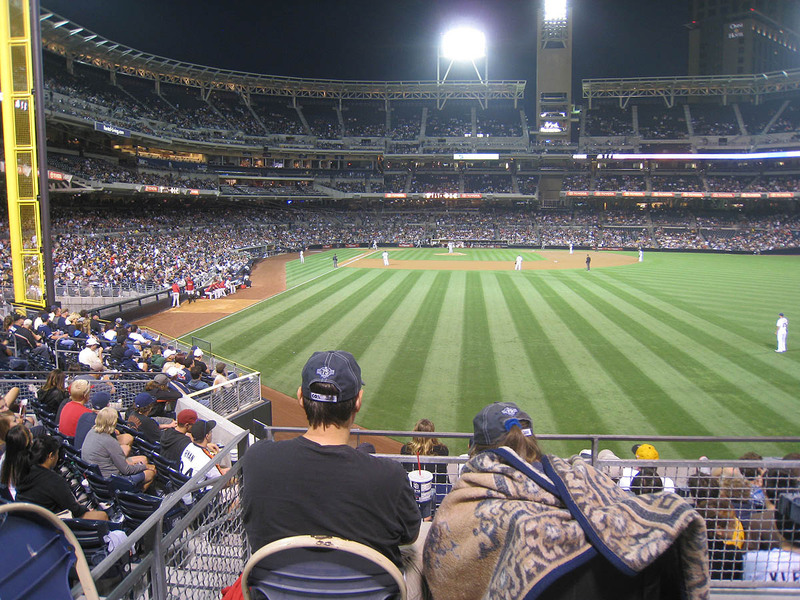 Most because it is a pick-your own game plan that is 100% flexible, but the seats are only $9 each. And I plan on sitting with the crazy people in RF. Mostly, because none of them bring gloves, just the signs and flags. That’s an interesting necklace the young lady is wearing. Never seen one quite like that. Yes. That’s what it’s for. Sounds like a good time. I think you should definitely get the 22-game plan.